Fermentation is an exciting, magical process in which naturally occurring microorganisms are allowed to colonize and alter food - for the better. It is the way many of our ancestors preserved food, in some cases making it more digestible, and (perhaps most important of all) created the delicious heady flavours fermented foods are known for. Fermentation is the process that turns grape juice into wine, cabbage into sauerkraut or kim chi, and milk into yoghurt and cheese. Black tea, coffee and even chocolate are all fermented foods! Fermentation at home is a dying skill, though. Modern society's fear of germs and obsession with hygiene means that it is seen as risky and somewhat radical. In reality, the over-use of antibacterial wipes and soaps is only contributing to the growth of antibiotic-resistant strains of bacteria, and the hyper-cleanliness of our modern world has arguably contributed to the alarming rise in childhood allergies in the last decade. We are losing touch with the vibrant fermentation traditions of our native cultures, as well as missing out on food that is truly alive, literally fizzing with vitamins, enzymes and beneficial bacteria. 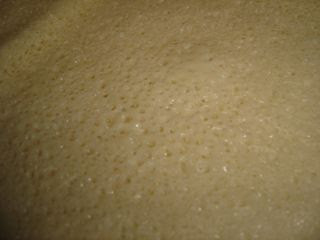 Fermentation is not hard! You don't need a mask, gown, or even a thermometer for most basic projects. 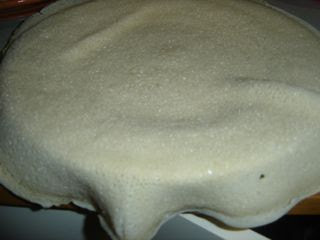 People have not been fermenting food for thousands of years because it is difficult, or fraught with danger. 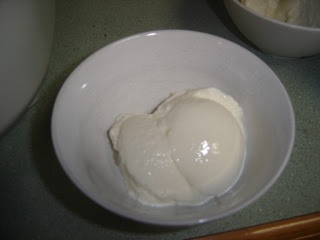 I have been making my own yoghurt for ages now, successfully keeping alive the same culture for months at a time. I enjoy the gentle rhythm fermentation winds through my days. The flavour and texture is superb, and it is full of natural probiotics. In addition, fermentation of milk can apparently make it tolerable for those with lactose intolerance. 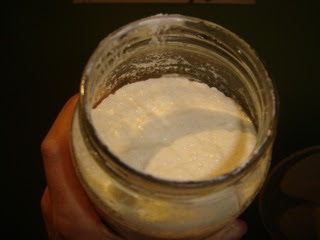 Best of all - I can now make a litre of yoghurt for around $1, rather than buying it for $5! Set the milk in a sink full of cold water until it reaches the point where you can hold a (clean) finger in it for 10 seconds without beads of sweat popping on your forehead. In other words, it should be pleasantly hot - above body-temperature, like a lovely warm-to-hot bath. If you forget about it and come back to stone-cold milk (as I inevitably do) - just reheat until you reach the pleasantly hot point described above. 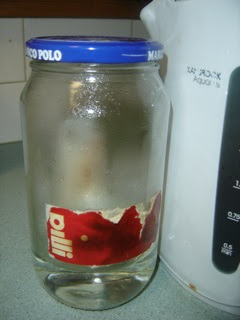 Pour a little boiling water into the jar to preheat it. It doesn't need to be sterilised (just clean). 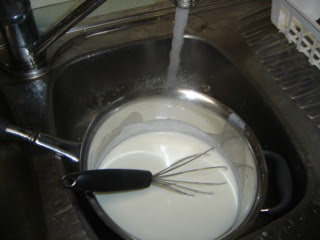 Whisk starter yoghurt into the milk. Resist the temptation to add extra - yes, 1 Tb really is enough! Too much and the culture gets "crowded" and doesn't set properly. In the olden days, the yoghurt remaining on the sides of the empty ceramic crock would be enough to culture the new batch. 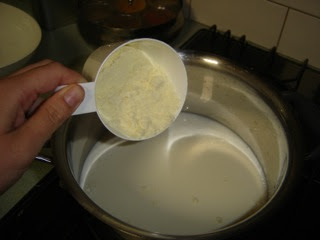 Pour milk/yoghurt mixture into the jar through a sieve. 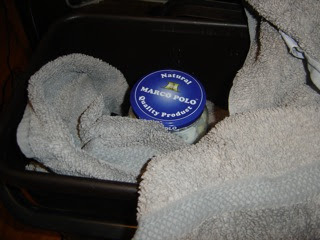 Cap the jar, wrap in a towel and place in an esky or similar. My esky isn't even insulated and it still works. Leave overnight. Longer is fine if you forget (yep, that's me again - fermentation is so forgiving!) The longer you leave it, the sourer it gets. It will firm up more when you put it in the fridge. How easy (and delicious) is that!? 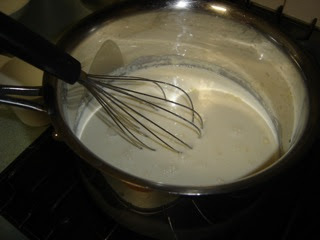 You can also make this with organic milk, or even with skim milk plus skim powdered milk for low-fat yoghurt. 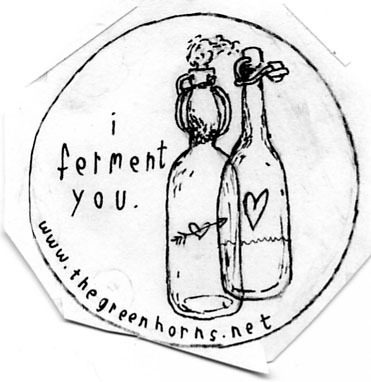 We are really passionate about fermentation, for its health benefits, its connection to human history, as well as its guerrilla nature, that we're somehow flipping the bird to so much of what we don't like about modern Western society - its plastic-fantastic, hyper-clean, standardized homogeneity. It's a great way to take control of more of your own food, bypassing mass production. If you're interested, I urge you to read Sandor Ellix Katz's incredible tome, Wild Fermentation. As time goes by, I hope to share more interesting projects with you, such as sourdough bread, sauerkraut and home-made ginger beer. Happy fermenting! When my first child was very young, I visited a relative whose daughter was doing a school project in which she had to write her favourite foods. I watched with the know-it-all disdain of a brand-new parent as she printed in wide, capital letters: HOT DOGS and CHOCOLATE CHIP COOKIES. "Hmph," I sniffed, "When it is her turn, MY daughter will write Pad Thai and pandan chiffon cake." Oh, hubris! Oh, the pride before the fall! 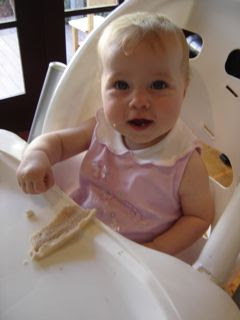 Despite having the most wannabe-Asian mother in Melbourne, despite having been weaned on moong dal and tofu, my eldest daughter has the most old-school, Anglo-Australian taste buds ever. She sulks through yum cha. She picks through her fried rice. Curry - rather go to bed hungry. 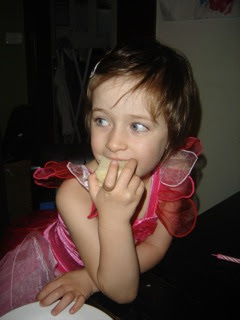 And thus, on her fourth birthday, when asked what she wanted for dinner, of course it was fish & chips. Hey - at least she didn't say McDonald's. 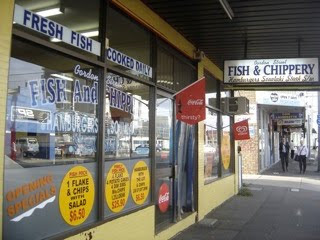 The shops on windswept Gordon Street, Footscray, are pretty uninspiring, but recently a new fish & chip shop popped up. We got their cheery flyer in our mailbox, and decided this was our chance to see if they could replace the now-defunct Chip & Fish Shack in our hearts. The couple who run this shop are so friendly and professional. 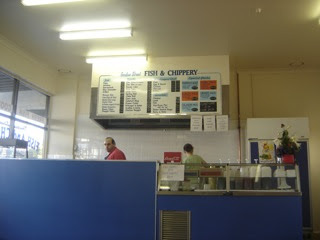 It's clean, bright and welcoming, and all the signs of a good fish & chip shop were there. Butcher's paper, not cardboard box - check. Old-school menu board - check. Plastic ribbon curtains - check. Oh, the batter! Crispy golden curls of it. Perfection! 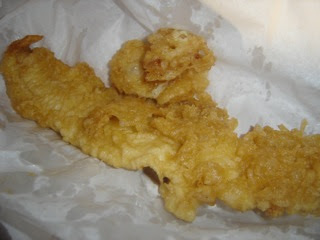 May I say, that this is some of the best fish & chip shop fish I've ever had. The blue grenadier, which I normally find mealy and unappealing, was so juicy and succulent. The flake had a delicate texture, far removed from the rubberiness of some specimens. The only incongruous exception was the whiting, which was overcooked, but the chef did throw in an extra fillet, "because they had shrunk". 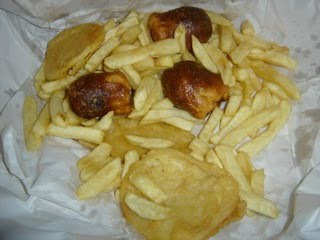 Great chips and proper potato cakes (plus, the few extra for free that earns bonus points in my book). Unfortunately no steamed South Melbourne Market dim sims, but the fried were so good with a dash of soy sauce. If you don't know what I mean by S. Melb. Market dimmies, get on down there and just look for the queue snaking down Cecil St. Some say they have gone downhill recently, but these had that fantastic peppery flavour and meaty texture I've always loved. They were kind enough to split our chips into normal salt and chicken salt. 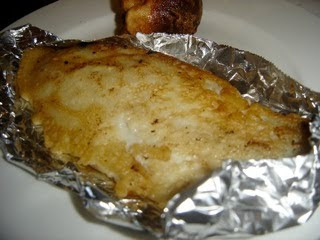 The bogan brother reported that his lamb souvlaki ($7.00) was not great, but really, who orders souvlaki from a fish & chip shop? We were adrift after the Chip & Fish Shack closed, and a recent trip to Ebi failed to excite. Gordon Street, with its friendly, family-run vibe, fabulous fish and more-ish chips, is our new spiritual home. UPDATE: I walked past 1/5/10 and the shop was closed, the fryer totally dismantled, no sign in the window or any signs of life. If anyone knows what is going on, leave a comment and let me know! Very disappointing if they have shut down, and very puzzling too! I have a friend who has an almost pathological aversion to classy ethnic restaurants. If the menu is not cracked and peeling, and does not feature such items as "Prok" and "Duck Ling", his appetite is not whetted. If a trip to the toilet does not entail a scramble over five bags of rice and a mega-box of paper napkins, to be greeted by a cracked rim and stained bowl, he is unmoved. The highest compliment he can pay to an eatery is, delivered in a hushed voice - "No whiteys!" For all these reasons, he would hate Sapa Hills - and he would be seriously missing out. Sapa Hills is the newcomer to Footscray's CBD and stands out with its English name and polished, modern interior design. 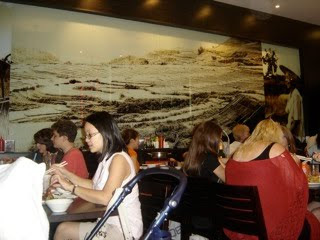 The stereotypical "hall of mirrors" of many Vietnamese restaurants has been dispensed with in favour of a panaroma of the restaurant's namesake, the hills of Sapa in northern Vietnam. Dark wooden tables and chairs are set neatly on a polished concrete floor. 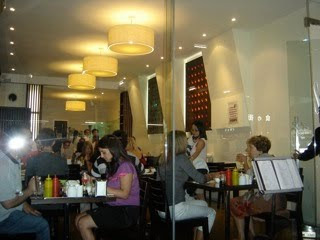 On Saturday night it was packed and we nabbed the last table. We started with Bo La Lot, which I recently learned you are supposed to wrap in lettuce and mint, à la spring rolls (I have always eaten them like dolmades - oops). These were amazing! 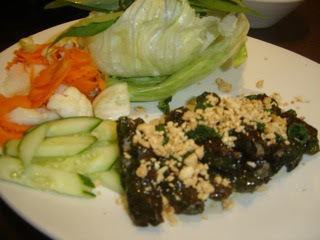 Peppery beef wrapped in betel leaves like little cigars, their pleasing fatty juiciness complimented by crunchy iceberg, refreshing mint and fantastic homemade pickled vegies - all dipped in seasoned fish sauce. 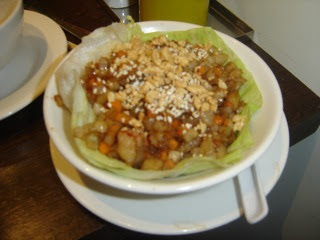 A seafood san choi bau, which was sweet with peanut, sesame and prawn. Pretty good. 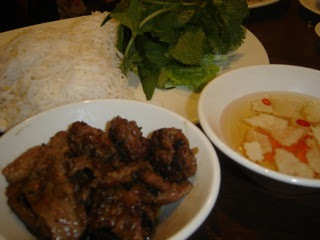 The star of the show - Hanoi-style grilled pork with rice vermicelli. The most tender, flavoursome pork, grilled over real wood charcoal (we checked), so juicy, peppery and meaty. Absolute heaven! (Phil, thanks for the tip-off.) Chatting with the owner, who comes from a family of Hanoi restaurateurs, we learned that this is his family's specialty back in Vietnam. If you have been tainted by dry, leathery pork, you have to try this. In fact, whoever you are, you HAVE to try this! Could it be bettered? 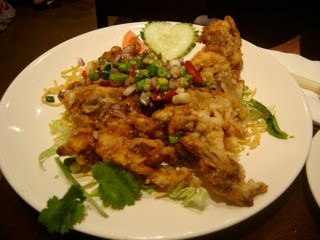 If anything was going to, soft shell crab was going to. These little beauties were ultra-crispy, tingling with spicy salt, on a bed of crispy noodles and lightly-wokked onion, spring onion and chilli. The meat was so fresh and juicy. Divine! We drank our beers and enjoyed the happy hub-bub of the restaurant. The owner explained he wanted to make a place where people could sit and enjoy more than just food - to enjoy a pleasant atmosphere, and not feel they had to "eat & run". We think he has hit on something big. I am ready to get down & dirty in any grimy café or restaurant in search of the best dosa, dumplings or duck, but what a treat to find such fabulous food in such a visually appealing and friendly venue! The owner spent a while chatting with us, and still made the rounds to chat with others, take orders and clear plates, as well as spring to open the door for almost every group of patrons leaving. 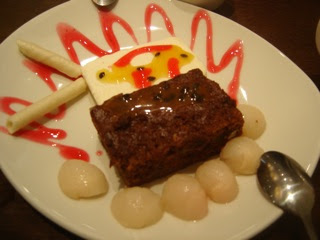 Just for the sheer joy of it, we had to try their sticky date pudding. 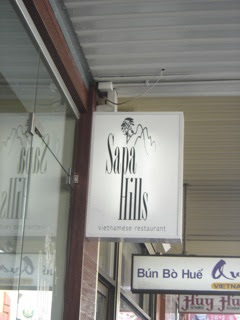 And yes, my nerdy birdy friend, Sapa Hills was full of whiteys, the toilets were spotless and the menus pristine. Let's go anyway - we can order their "Steamed Boat", just so you feel at home. Where to start when beginning to explore the food out Footscray way? A great place to start would be the three great soups of the west - cleansing, warming pho from Hung Vuong in Footscray; balanced yet fiery laksa from Laksa King in Flemington; and unctuous, luscious haleem from Madhumoti, also in Footscray. B and I stumbled upon it, and I had to take Mr Baklover to try it out. 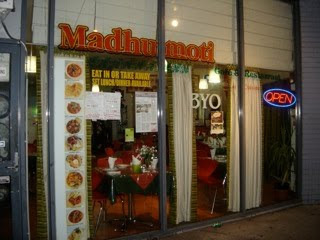 This Bangladeshi restaurant has possibly the sweetest, most heartfelt service in Melbourne. 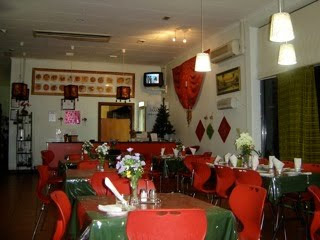 I love the nanna-style decor with plastic flowers, clear plastic tablecloths and endearingly daggy crockery. We came for one thing - the haleem. This is a soupy Bangladeshi dish made from a blend of rice, lentils and wheat, which have collapsed into one another over hours of cooking into a thick, nutty stew. 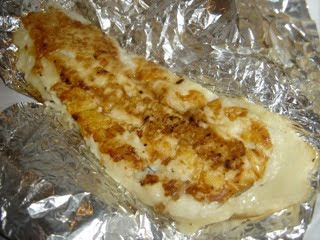 Its creamy surface conceals pieces of meat, their fibres rendered fork-tender through hours of slow, low heat. This bowl was fresh with zingy ginger, balanced with earthy spices, with the slow burn of green chillies. Divine! The house specials are marked in red on the menu, so we chose the Chicken Tikka Butter Masala from among them. The chicken was very tender, served in a creamy tomato sauce with capsicum and onion, and spiced with fresh curry leaves and - my favourite - dried fenugreek leaves. Fenugreek as a whole spice is wonderful, with a really "classic" curry aroma, but it can become overpowering if not used judiciously. The leaves impart the same aromatic quality but in a much gentler form. 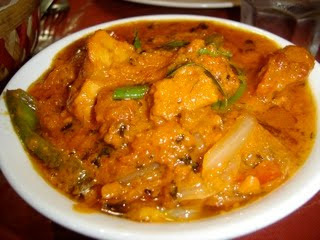 The vegetarian options are split between classic North Indian fare such as aloo mutter and vegetable korma, and authentic Bangladeshi preparations. 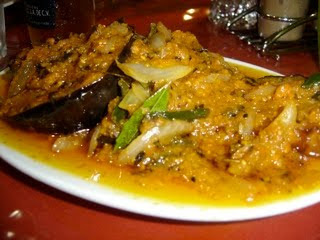 From the latter list, we chose Begun Bhaji, described as "finely cut eggplant cooked with onion, spices & mild chilli". Discs of fried eggplant topped with a tomato, onion & garlic mixture, seasoned with panch phoron, the classic Bengali spice mix of whole mustard seeds, cumin seeds, fenugreek seeds, fennel seeds and nigella, also known as kalonji or black cumin. 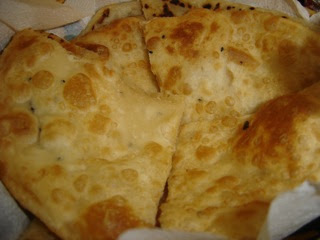 We eschewed rice in favour of some simple roti and some indulgent "special paratha". 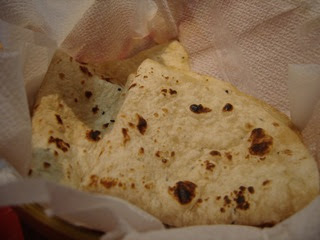 The roti had a fantastic chewy texture, while the special paratha - crispy and flaky, due to its being rolled, spread with ghee or oil then re-rolled (somewhat like puff pastry or croissants) - was suitably indulgent. 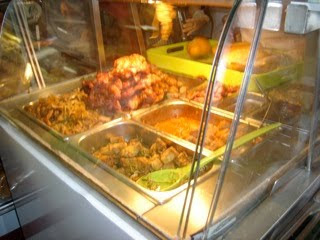 However - the food, despite its careful, individual spicing and gentle cooking, was spoiled by tonnes and tonnes of oil. The eggplant sat in a puddle of the stuff like its own little island, its fresh panch phoron flavours dissipating into the slick. As we took spoonfuls of chicken, the hollows would be replaced by little oases of oil as shiny rivulets ran in from the sides of the bowl. Our chins grew unpleasantly greasy and my appetite was dampened. What a pity. 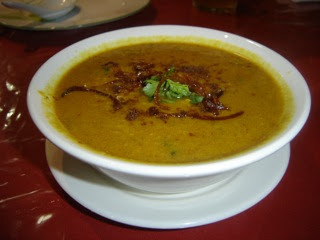 I will be back, however, if only for the haleem. 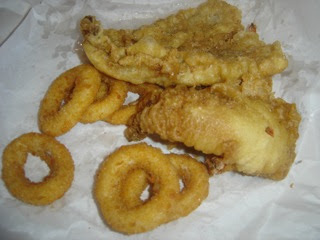 We used to be luckily enough to have the greatest fish & chip shop around the corner. It was a melée on Friday night in particular, the bench seat where you waited strewn with yellowing local papers, the workers behind the counter plunging baskets of chips into hot oil and flipping burgers in a complex dance. 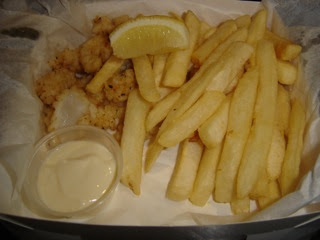 Recently it shut down and reopened as Ebi Fine Food, "Japanese fusion fish & chips". We have been meaning to try it for ages and this was the night. The greasy vinyl curtains and humming fridge have been replaced with a neat, dark-wood counter overlooking shining steel surfaces. Traditional Japanese shop banners flutter in the doorway. They have interesting fish, such as rockling and mirror dory. I think the owner has some interesting tales to tell, as the walls are decorated with backstage passes from big 90s rock bands, labelled "Driver", as well as lovingly framed photographs of Japan. 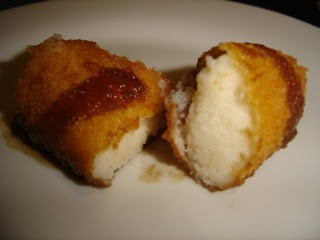 The croquette was OK, panko-crispy with a drizzle of Japanese BBQ sauce. 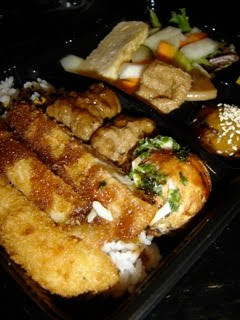 The bento ("Today's taste of everything good") had juicy, fruity meatballs, a vegetarian takoyaki or octopus ball, decent-enough tonkatsu and panko-crumbed prawn, on rice sprinkled with a delicious seaweed & bonito topping. The standout was the pickled vegetable salad - ultra-crispy chunks of daikon radish, celery, cucumber and carrot, sweet with a vinegar tang. I would have been happy with a big bowl of the seasoned rice and an accompanying plate of pickles. There was also a luscious morsel of meltingly-soft fried eggplant topped with creamy miso. Yum! The calamari was lightly cooked with a light yet deceptively spicy coating, and although it suffered a loss of crispiness on the walk home, it was delicious. The chips were, well, just chips. Footscray and West Footscray are turning on their rusty, industrial hinges, squinting as they turn towards the light of a new dawn. Gentrification is happening, albeit slowly. Every time I see a shopfront in my residential pocket undergoing a refit, I pray for a La Paloma-style café, but it normally becomes another hairdresser. Ebi was empty at 7.30pm on a Saturday night, while the Chip & Fish Shack used to be jumping with people from all strata of society. 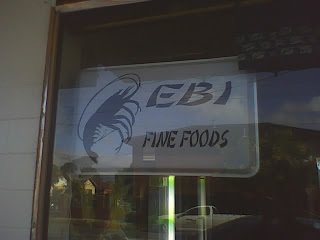 Ebi's food is delicately detailed and painstakingly authentic, and even though their prices are very low for what they are offering, I fear they are "before their time". Next time, I hope to sit at the counter and enjoy the food as it should be enjoyed, not steamed for 5 minutes in a paper bag. Let's hope they are still there by the time I get around to it. Update: I had a few pieces of sushi from a friend's lunch pack yesterday and they were really good, with big points for a smear of wasabi between super-fresh fish and rice. A bit cold, but that is the Health Department's fault. My friend said that Ebi apparently has the contract to supply the nearby school with sushi for lunch orders - so maybe they will be around long-term after all. I know I'd love my kids to have sushi from the tuck shop rather than a pie! 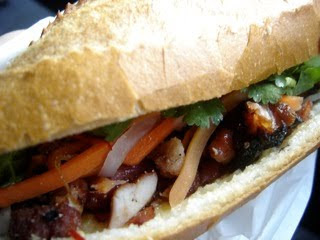 I still really miss the fact I could run downstairs from my place and grab a banh mi (Vietnamese pork roll) or some xoi cuc Ha Noi (Hanoi-style sticky rice with chrysanthemum) or even a quick bowl of pho. So naturally, I had to buy a pork roll for breakfast on the way to work. And then I had to buy one for lunch too. Research purposes, people! It may have been 8.30am but Nhu Lan was pumping. 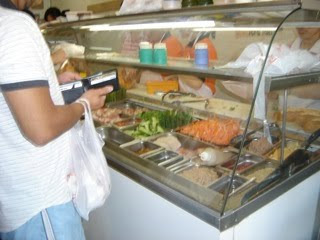 You have to be pushy or you will get swept aside as more customers flood in, demanding their favourites, while the ladies behind the counter deftly slice steaming rolls, spread pâté, and rifle through their lunchboxes of takings to find you your change. Your choices are divided between cold and hot offerings, from mixed ham or bi (shredded pork skin), or any one of BBQ chicken, pork, chicken & onion, tofu, as well as interesting "kebabs" and "xiu mai" (like the eponymous yum cha dumpling, without the skin, in a vibrant red sauce). My favourite roll is BBQ chicken. The sticky red thigh is plucked from a pile which seems a foot high, tossed on the weathered, stained chopping board and with a few satisfying thuck thucks of the cleaver, sliced for stuffing into your crispy roll. This is topped with pickled carrot and radish, cucumber, coriander, chilli and special sauce, before being tucked in a crisp paper bag and sealed with an efficient twist. The chicken is warm and juicy, melding with the soft yet crunchy roll, accented by fantastic, sweet, tangy pickles. YUM! 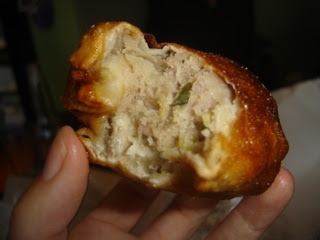 All you suckers getting "chicken" rolls at Subway - walk the extra block and you'll never look back! 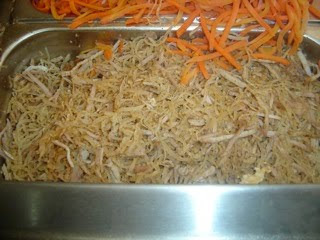 Bi is usually described as "shredded pork skin". I'd never had it before and was curious. I don't see how it can be the skin, though, as it is meltingly soft, and surely the skin would be horribly tough and chewy unless it were made into crackling? (Then again, that is probably just me, trying to find an excuse to make crackling.) It seems to me to be the under-skin layer of fat, shredded and mixed with a little lean meat. If you can enlighten me, please do so. 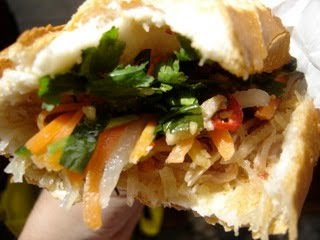 Unlike the chicken roll, the bi version was seasoned with chopped peanuts, fried onions or shallots, nuoc mam cham or seasoned fish sauce, and marinated, chopped spring onions. The bi was very tender and sweet, but too fatty for my taste to eat for a whole sandwich. It would be great as a kind of relish on the side of an otherwise light dish, such as a simple bowl of rice. 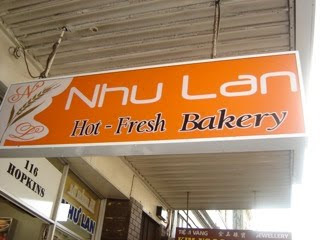 I can't fault Nhu Lan for the execution though, which seemed to me to be perfect - as always.